Conservation in the Catch All. Last Sept, I was out of town playing shows down south and missed the Lower Yuba River Cleanup led by South Yuba River Citizens League otherwise known as SYRCL, also missing the cleanup led by the Army Corp of Engineers on Englebright Lake held on National Parks Day on Sept 17th. These two waterways are incredibly special to my family and I in both my personal and professional life so naturally I was disappointed to miss them but it wasn't the first time I'd traded home life for road life. When I got back into my routine of getting out, I ended up on the lake chasing fall smallmouth and noticed there was still quite a bit of trash around even after the cleanup. The truth is the trash is always on it's way. The good folks down at the Army Corp of Engineers, Skipper's Cove Marina, the volunteers and my friends and I all do what we can to keep the place beautiful, the water clean and the fish healthy. Truth is, it's not and never enough as long as there are living humans around from the coast to the headwaters. Trash will show up in the water. I'm all for cleaning up the river. As an admirer of the outdoors, it's simply what we do to help preserve the wild places we love and to rest easier at night. That's just one of the duties and price to pay for the opportunity to be on a river and the right responsibility to take if we want to return. I have the utmost respect for any individual, group or organization who goes out of their way to take part in any cleanup campaign but what I feel is lacking often all over this country is going straight to the source more often, wherever that may be to capture it early and eliminate it entirely. Or going to whatever or whomever it may be that's causing the problem to raise that awareness. I participated in a cleanup on a day off from a Warped Tour where 185 of us joined Blue Water Baltimore and removed over 2,000 pounds from the Gywnns Fall River one morning. I remember that it seemed like the majority of the garbage consisted of single use plastic bags or fast food containers. What's unfortunate is that as we cleaned up a bit, the culprit was still very much at large so to speak. The parks and roadways were being littered as we worked. The unaware people with no conscience demonstrating to their children that there's nothing wrong with throwing a candy wrapper or trash bag over the bridge and into the water. It's hard to blame the ones who contribute to the problem. In a way I feel as if it isn't their fault. I feel the problem lies at the very source of that persons ideals and on whomever it was that raised them. When someone isn't connected with the outdoors at an early age or throughout their life, they most certainly will not grow to love, nurture, respect and protect the natural world around them. 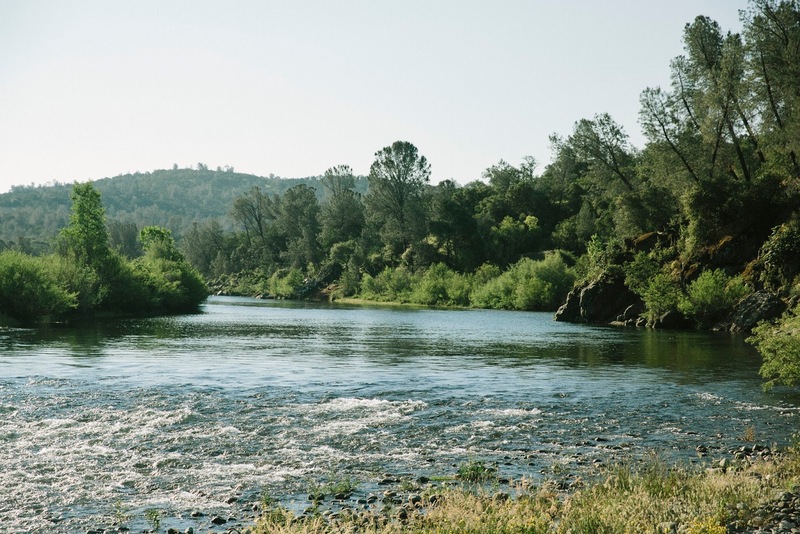 The vast majority of the garbage that we carry out of the Lower Yuba does not come from Lower Yuba river recreation. Some folks may believe that a lot of it is from irresponsible lower river campers or negligent motorists who literally throw a bag of garbage or bottles out of their car while passing over the bridge to land less than 50 feet from where we launch our drift boats... Yes, some garbage comes from the sky or out of the car campers care but it's a small percentage with the exception of the occasional bonehead who has no problem dumping off old entire boats or broken down campers in the riverbed full of you name it. From Parks Bar Bridge up to the dam, there's very little public traffic which means very little garbage coming from that zone unless it's coming out of Deer Creek which begins well above Scott's Flat Reservoir and winds it's way down through Nevada City past many residences with accessible and used trails all around it. The impact to the creek itself has been and can be tremendous and whatever is left, leeched or lost on the bank before the heavy rains come gushing, will find it's way into the river. So where else would all the trash be coming from? Understanding that is understanding where all the water comes from and what roadways, development, recreation areas or the like are neighboring that water. Understanding the sources and their locations can help remedy the overall problem. Below is a map pulled off of https://pubs.usgs.gov/of/2006/1346/images/figure1_sm.gif. Just for a moment, look at these reservoirs on the map and imagine them for exactly what they are. Catch alls catching everything that floats or rolls with a heavy enough current. What that means is that anything dropped on the ground, left at a campsite, washed down the mountain or blown off the boat will most likely end up in one of the catch alls if it doesn't get lodged within the river bed or hung on a snag. From there it either gets picked up, pushed on or becomes one with the dirt and water, seeping whatever it's made out of into the drink. This is the main reason why there is always room for more efforts. Because it's never-ending. Not just on the lower, not just in our local lakes but all the way up the hill. This is how the trash moves and how it eventually ends up on the banks or in the bays. 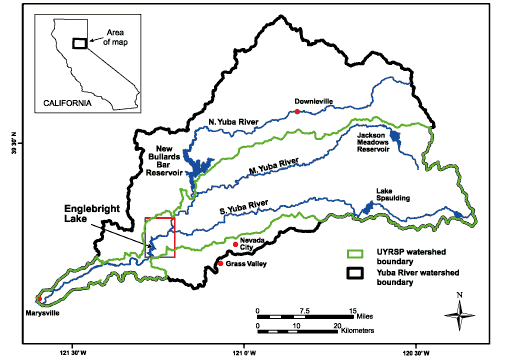 Before the Lower Yuba, Englebright is the last bucket in the chain after a series of rivers, tributaries and reservoirs. This has been one of my go to places since I've lived here and if anyone spends a lot of time anywhere, it's simple to observe and mark changes easier than just visiting once in a while. 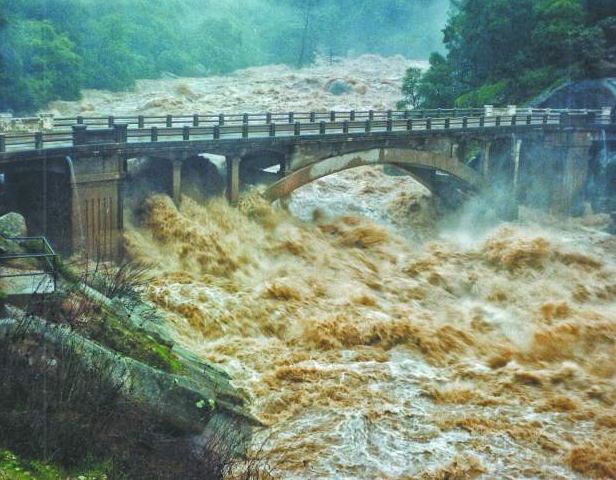 Many of us who live up in the mountains, foothills or down in the valleys of Northern California are very familiar with the last major event we had where our rivers rose drastically along with reservoir levels during a heavy warm rain storm that quickly melted off a lot of our snow up the hill. The Yuba right out our back door which we had been drifting on at 1800-2K cfs 6 days prior went to over 81,000 cfs. The amount of water was strong enough to level hills, structures, move boulders, remove trees and of course carry any non organic materials in it's path to the bay and then out to sea with the tide. Throughout the year when the water is low, the weather is gorgeous and activities are high, so will be the rubbish. As the rains come and the snow melts that rubbish is sent down the hill passing and collecting more and more through every overpass, campground or residence until it reaches Englebright Reservoir. We have a lot of beautiful boat in only campsites on EB and a lot of folks who care deeply about it but that doesn't mean accidents don't happen there either. The reservoir there is a wild place, when the flows are pumping out of the South Fork of the Yuba as well as water released by Bullards and joined by The Middle Fork and other creeks, it basically becomes a mammoth and merciless 220'+ deep flowing river complete with massive eddys and collection pools where trees, lumber, debris of all sorts and garbage collect in abundance. If the flows are pushing and filling enough for the dam to spill, that garbage finds it's home on the rocks and trees as the water recedes. If not, it's pushed and sent over and into the Narrows which is the canyon below the dam and the beginning of what we know as the Lower Yuba River. So that's where it comes from in a nut shell. As far as what we do about it, my only answer is to do our part wherever and however we can within our local community. Either alone or with one of the many organizations that band together to make a difference. Again, preaching to the choir in a lot of ways on this one but that doesn't mean we can't share that ethic with someone on the fence about it or even a complete stranger. Let's vow not to let negligence slide. Last November, the Reel Anglers Fly Shop crew made up of Tom Page, Clay Hash and myself brought our boats down along with 9 members of our club Gold Country Fly Fishers to go straight to the source as we know it. We organized a get together for a day of walking the banks and picking up garbage. There had been a cleanup a month or so prior and the banks were pretty good but we still managed however to pick up and weigh out just over 150 pounds of trash. I know this sounds like nothing but it was really something within the short period we worked since the majority of the garbage were plastic and small pieces at that. Micro Trash as Tom Bookholzt down at USACE calls it. It was great but we all knew that the heavy stuff would be on the way soon. Well it's here now and we aim to continue these efforts and purposely stagger them as far away from any other efforts out there for the greater good and a constant public sweep. 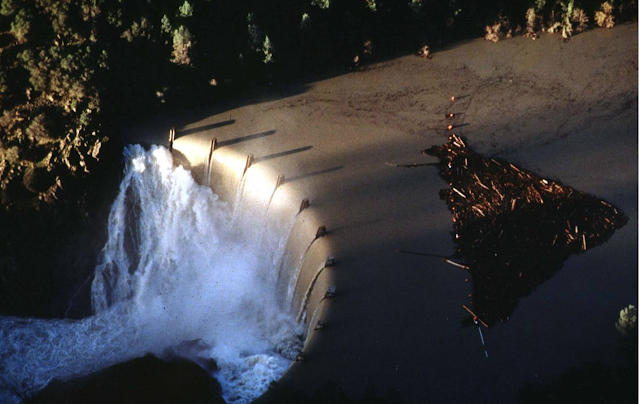 Especially since this reservoir rises and falls like a tidal system and the trash appears and disappears at random. I've been out on the lake since the last big water event and the amount of trash and debris is absolutely incredible. Reel Anglers Fly Shop along with USACE will be hosting another cleanup day on Earth Day, April 22nd and we're inviting anyone willing to join with boats, canoes, kayaks, paddle boards or just a good pair of waders or hiking boots to meet us at Englebright Reservoir at 8a.m. With the help of the Army Corp of Engineers we'll provide boat shuttles to different locations for those on foot. Kayakers and canoers will be assigned to closer locations. We'll be providing a big shore lunch BBQ at noon at Long's cove. The Army Corp will provide the trash bags and we will be weighing out and recycling or disposing of it at the end of the day. No one will be charged for parking fees and every participant will receive a coupon that will be good for free admission to any park under USACE in the future. We ask anyone who loves this area, cares about clean water, healthy fish, healthy kids and a healthy river to please join us. What: Englebright Lake Cleanup to benefit the fishery there and every living thing, from here to the coast and beyond. When: APRIL 22ND EARTH DAY. 8 a.m.- 4 p.m. Turn North onto Mooney Flat Road. Take a left on Englebright Dam Rd. We'll meet at the launch.